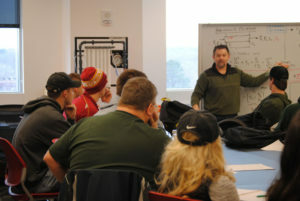 Professor Steve Hoff teaches freshman agricultural and biosystems engineering students about pipe flow dynamics. The department, jointly administered by the College of Agriculture and Life Sciences and the College of Engineering, tied with Purdue University for the top ranking. Steven Mickelson, department chair, credits new facilities and the growth in undergraduate and graduate students to the No. 1 ranking. The department had a 46 percent increase in undergraduate students and a 25 percent increase in graduate students in the last 5 years. “We have always been ranked in the top 10, but the reason why we are moving up [in the rankings] is because of the new facility,” Mickelson said. The $107 million facility, Elings Hall, Sukup Hall and the Biorenewables Research Laboratory, constructed in 2014, offers state-of-the-art classrooms and laboratories. The new facility has allowed for collaboration between the Center for Industrial Research and Service and the university for industrial research. This summer, money from the Iowa Economic Development Authority and federal and Iowa State University funding was used toward the purchase of a 3-D metal printer and other technologies to contribute to students’ education. Iowa State also acquired a state-of-the-art water flume that simulates streamflow to assist in crop research. Mickelson also emphasizes the importance of hands-on learning experiences in the classroom. Hands-on learning curriculum classes account for 38 percent of all classes in the department. “Hiring high-quality faculty, getting the right people on the bus to being with is what makes this department great,” Mickelson said. Moving forward, Mickelson wants to see the graduate program, which is currently ranked No. 2 by the U.S. News and World Report, be ranked first in the nation. The undergraduate program is tied with Purdue University. The agricultural and biosystems engineering department undergraduate program is the first Iowa State department to be ranked No. 1.